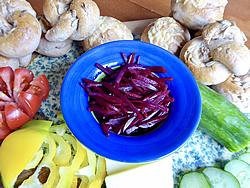 Wash beetroot (no need to peel if young and tender). Cut into very fine matchstick size pieces. Put chopped beetroot in a bowl and sprinkle over 1 teasp. salt. Leave for 15 minutes while they release their juices. Rinse beets and pat dry. In a small pot, make up a brine with all remaining ingredients and simmer for 5 minutes. Pour over finely sliced beetroot, cool, cover and refrigerate at least a day before eating them. Will keep well in fridge for a week. After making up the brine, add finely sliced beetroot and simmer everything for 5 minutes. This slightly tenderises the beetroot. Wash beetroot, leaving a small amount of stalks. Put in large pot and cover with cold water. Cover pot. Peel and cut into 1.5 - 2cm cubes. 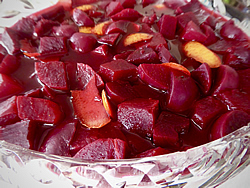 Make brine as above, (in Recipe 1) but instead of using 1 cup water, use 1 cup beetroot juice. Simmer all ingredients 5 minutes then pour over cut up beetroot.